It’s another huge episode folks, heck it’s almost as big as this big brown land we call home. Talk’n ‘Stralian: John teaches Kev how to buy bread and milk with an Aussie accent. 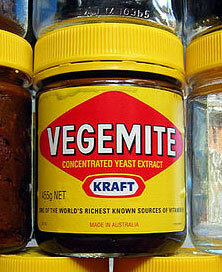 Vegemite. The iconic Australian salty spread. Listen in as Kev tries it for the first time. April 25th is ANZAC day in Australia, so Kev thought that he’d tell John all about this important Australian holiday. You are currently browsing the Lost Out Back weblog archives for the month May, 2006.